When Kimberly Bryant founded Black Girls Code, she hoped her pre-teen daughter would be able to learn computer programming without feeling isolated. But once launched, it was clear that Black Girls Code had tapped into a tremendous need—not just for Kimberly’s daughter, but for so many other pre-teen girls as well. To keep up with demand, the small startup scaled quickly: Chapters launched in quick succession. Parents and alumni wanted to get more and more involved. Sponsors wanted in. And while this incredible interest was exciting, it also pushed the limits of BCG’s small but mighty staff of six. To scale her budding venture with authenticity and care, Kimberly reached out to Openbox. Openbox delivered organizational tools to empower staff and volunteers to champion BGC’s mission across geographies and communities. 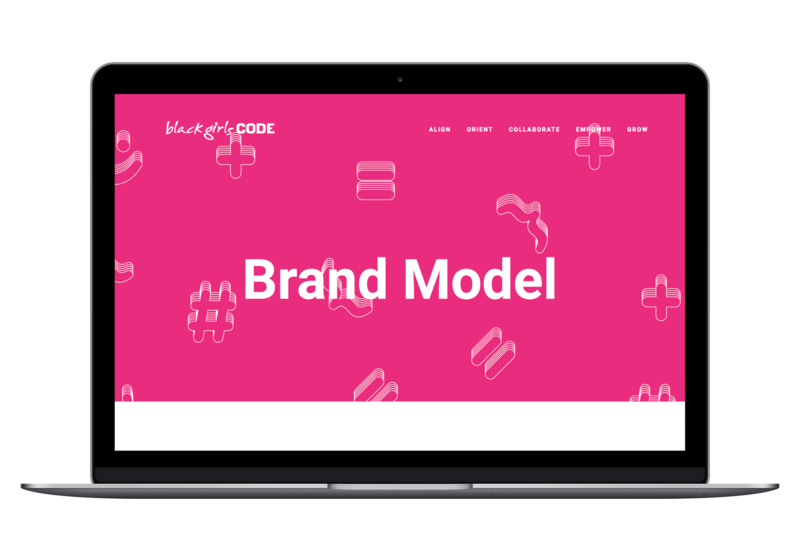 An internal toolkit, accessible in print and on the computer, explains the Black Girls Code brand model and culture to every staff member and volunteer. In order to more intimately understand BGC’s challenges and opportunities, the Openbox team conducted in-depth interviews and observations with key stakeholders including parents, staff, volunteers, and students. It quickly became clear that along with the massive influx of excitement, the staff was constantly facing new scenarios. As new situation arose, solutions were improvised—in turn made consistency and efficiency a huge challenge. With BCG’s aspirations and constraints in mind, we designed a new organizational structure and communication materials for socializing standard processes and roles. Image courtesy of some plants. Like many new ventures, the BCG staff truly embody the organization’s mission. Openbox began by designing practices and procedures that do a better job of supporting the people and values at the heart of BCG. This freed up staff time and brainpower so they could use those resources to tackle BCG’s more strategic and creative challenges. We worked alongside BGC staff to define more distinct roles and responsibilities. This gave staff clearer permissions and purviews, and a greater sense of agency within the organization. Taken together, these strategies helped BGC stay intentional, grounded and on-mission as they grew, and allowed them to scale with authenticity. Today, Black Girls Code has chapters nationwide and has served over 5000 girls. Some former participants are now majoring in computer science at top schools. And BGC intends to keep growing, with purpose.